“Therefore sprang there even of one, and him as good as dead, so many as the stars of the sky in multitude, and as the sand which is by the seashore innumerable” (Heb 11:12). Abraham’s children were like the stars and like the sand of the seashore. We need both these experiences. Stars shine in the dark night and guide travelers on their way. 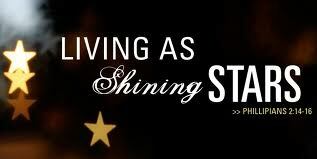 Those who turn people to righteousness are like stars (Dan 12:3). Are we, by our life and by our words, helping people find their way to the Lord, helping them find the way to peace, joy and rest, to holiness and victory? Does our holiness in all conduct show people living in the dark the difference between right and wrong, the difference between holiness and most holiness? It isn’t enough if we are high in the sky, bright and shining. How do we respond to the hard-to-take situations and people we face in our day-to-day life? The sand of the seashore is continually, day in and day out, battered by the rolling waves, and made smaller, rounder and whiter as days pass, The hardships and problems in life should not knock us flat, but help us to become humbler, softer and purer. This is our attitude towards them that make all the difference. How are you going to face today? Will you be a star? Will you be a grain of sand on the seashore?